We all know that keeping servers up to date is one of the most important aspects of keeping a secure environment. At one point or another every systems administrator is faced with the challenge of having to apply updates to numerous remote servers on a network. We have all been through the tedious process of manually connecting on an individual basis to each target computer, then applying updates or configuration changes, rebooting the computer, waiting 10 minutes, then checking to verify the computer did in fact reboot and that it did come back online after reboot. Multiply this process by a dozen or a hundred or even one thousand target computers, and all of a sudden the process becomes unwieldy, time-consuming, and downright stressful. The more computers that one is managing, the more quickly it becomes difficult to successfully keep track of the status of each target computer during such a process. Wouldn’t it be easier if we could just have a single console to manage all of the target computers, regardless of whether it’s 10, 20, 50, or 1000 machines? BatchPatch was designed to make life easy for the systems administrators and engineers of the world. It enables the administrator to apply updates or make settings changes or to run scripts or applications remotely to numerous computers, simultaneously. No longer do you have to keep track of each machine individually with numerous remote desktop windows and ping windows etc. Instead you can just launch BatchPatch, add the desired target computers, select the desired action, and then just sit back and watch all target computers perform the specified action. You can install Windows Updates, deploy third party software or updates, deploy registry keys, run custom scripts, gather information for inventory or other purposes, etc. Or you can string together numerous actions into complete ‘job queues’ for single-click automation efforts. 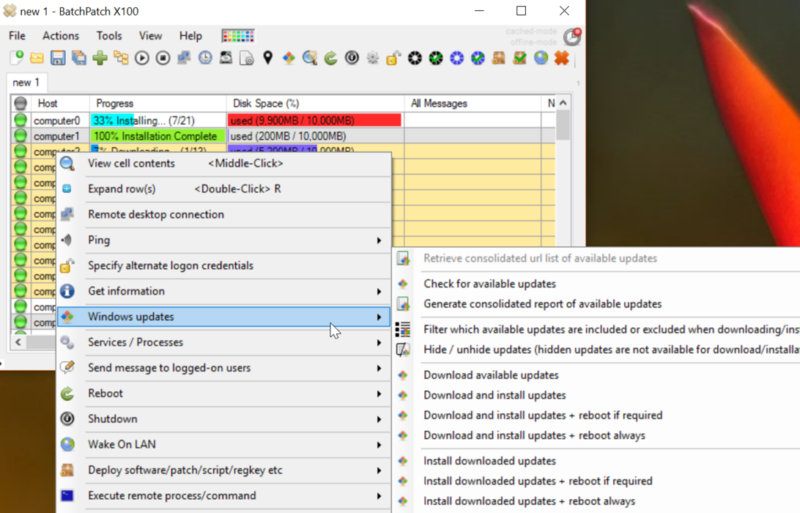 This entry was posted in Blog, General, Topics, Tutorials and tagged server patching tools, windows update. Bookmark the permalink. Both comments and trackbacks are currently closed.